ysabetwordsmith | Poem: "Pull on the Smallest of Holds"
Poem: "Pull on the Smallest of Holds"
This poem came out of the February 2, 2016 Poetry Fishbowl. It was inspired by prompts from mdlbear and kelkyag. It also fills the "Our Special Place" square in my 1-23-16 card for the Valentine's Day Bingo fest. This poem has been sponsored by janetmiles. It belongs to the series Polychrome Heroics. "Pull on the Smallest of Holds"
lost and adrift. Nothing mattered anymore. She had trouble holding down a job or a home. the world go by without her. Liv needed things to do. Stevenson Lake for hours on end. that dominated the athletic field. until she grew bored with them. as she picked at her peeling palms. the military is like climbing a mountain,"
within reach, pull on the smallest of holds." had made down a long clay slope. who understood other people better than himself. new to do," he said thoughtfully. clambering along the nets and lines. "This is great while we have it," Liv said. actually make a difference here." listening to Liv, "is a real project." a permanent rope course of their very own. and the assembly all by themselves. two platforms and festooned with climbing ropes. then stripped the branches and bark to sand it smooth. They cut more trees to make boards for the platforms. under her fingertips and the smell of linseed oil. plenty of rope to connect them. 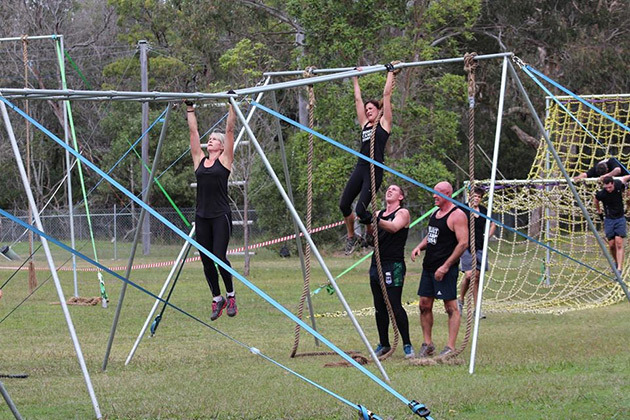 cargo nets and rope ladders and trapezes. circles and squares and hollow rectangles. never meant to be perfectly safe. on the vast, swaying network of ropes. "We made our own special place,"
Liv said happily, looking up at it. Squirrel Haven was a huge success. the weekend at the veterans retreat. despite missing his left leg near the hip. both of his legs were severed near the hips. wanted to explore the course with his guide dog. "That would be pretty dangerous," Liv observed. and back. Life is dangerous. Live it anyway." "Suppose there were an emergency,"
get them up there somehow." wove a dog harness out of paracord. "I know," Milo said with a grin. for Jaimeson. "Ain't it grand?" Liv had to agree that it was. unless we want to clear a lot of trees,"
rope toy in the catalogs." "I miss working in metal," Liv mused. clapping his hands together and rubbing them. So Liv got out her sketchbook and began to draw. Liv Dunwoody -- She has tawny skin, streaked blonde hair, and green eyes. As an engineer, building things makes her feel useful. After leaving the army, Liv feels adrift in the world, like nothing she does really matters. Currently she is staying at the Dumont Veterans Retreat just outside of Easy City in Louisiana. Burley Desbois -- He has ebony skin, brown eyes, and nappy white hair with a mustache and beard. He served in the Vietnam War. Currently he supervises the Turing Lodge at the Dumont Veterans Retreat. That provides guidance for the residents and guests from someone who knows what it's like to go to war, and come back changed. As a hobby, Burley carves figurines and makes dioramas, often of military or historic scenes. Milo Leahy -- He has tawny-fair skin, brown eyes, and short brown hair. He comes from Nebraska. Currently he is staying at the Dumont Veterans Retreat just outside of Easy City in Louisiana. Milo is a playful man and a skilled leader. However, understands other people better than himself, and tends to distract himself rather than deal with difficult personal issues. Holden Morrisett -- He has fair skin, blue eyes, and light brown hair. He is missing his left leg near the hip and uses a wheelchair. He served in the Marines for three and a half years prior to his injury. Now he lives in Suite 107b of the Laguardia Residence Hall in Easy City. He enjoys playing wheelchair basketball and memorizing the stats of other players. Donjae Roberson -- He has brown skin, brown eyes, and very short black hair. Both legs were severed near the hips, so he uses a wheelchair. He served in the Navy for just over two years prior to his injury. Now he lives in Suite 107b of the Laguardia Residence Hall in Easy City. He enjoys playing wheelchair basketball and collecting basketball cards. Jaimeson Tate -- He has brown skin, one brown eye, and nappy dark brown hair worn short on top and shaved at the sides. He is fully blind, his left eye missing and his right nonfunctional. He navigates with a guide dog, Buttercup, and wants to learn how to pinpoint people with his other senses. Buttercup is a golden retriever, and she shares her owner's bubbly personality. Prior to his injury, he served as an Army sniper, but it wasn't even a year before he was sent home with a medical discharge. Now he lives in Suite 107a of the Laguardia Residence Hall in Easy City. Jaimeson prefers playing dice to cards, and particularly excels at Pirate Dice. "I may not be able to pull on the smallest of holds, but those I can pull on I can pull on all day long." Rejoining civilian life poses many challenges for returning veterans. (Note that this uses the military definitions: "serving military personnel" and "civilians = everyone else." T-American use more often divides people into "first responders," "citizen responders," and "civilians = people who can't/won't help in a crisis and must be protected.") One of the greatest difficulties is loss of purpose, so veterans must find and pursue life purpose in a new direction. Understand how to talk with veterans and help them with readjustment and general support. There are tips for returning veterans too. Here is a post-deployment booklet for soldiers and families. Dumont Veterans Retreat lies just outside of Easy City, Louisiana and is named after Alberto Santos-Dumont, a Brazilian aviator. 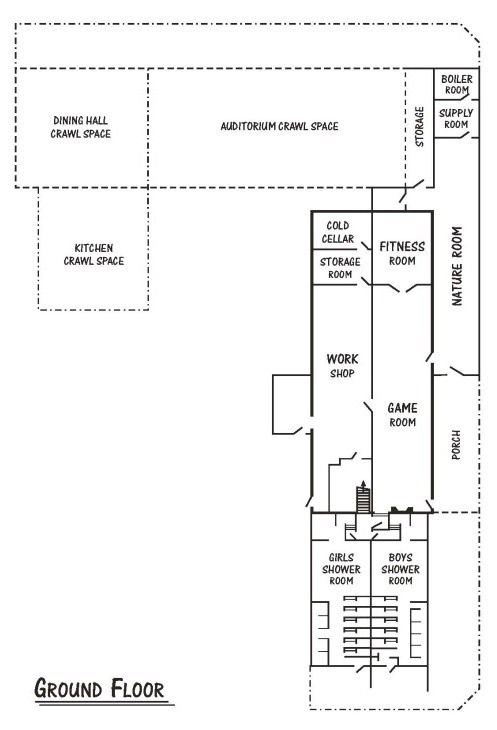 This facility includes about 150 acres and two large buildings, the Turing Lodge and the Gymnatorium. 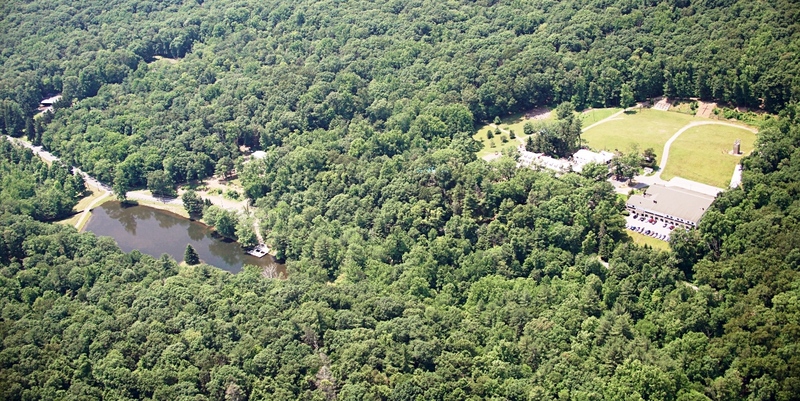 Along with the main buildings, facilities include two outdoor chapels, hiking trails, wilderness camping, a 4.5 acre lake with picnic pavilion, camp fire circles, an athletic field, basketball and sand volleyball courts, a swimming pool, obstacle equipment, and a 30-foot climbing tower with zip line. Turing Lodge stands four storeys tall. The ground floor has a wraparound overhang, which is also the porch for the first floor aboveground. Parts of that porch have overhangs from the third storey. 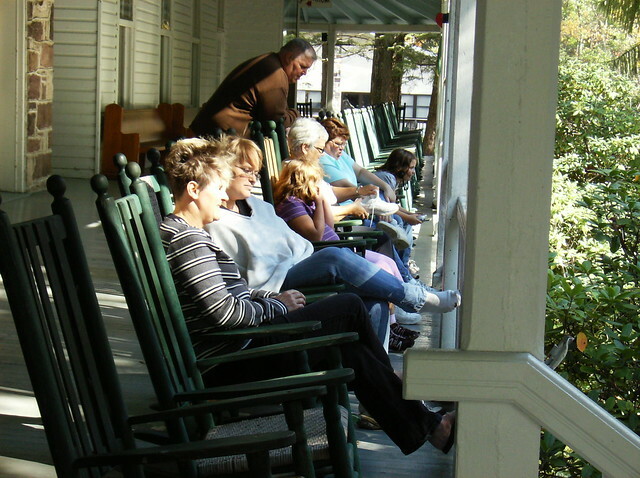 The main porch stretches 400 feet around three sides of the lodge, holding over a hundred rocking chairs to invite relaxation and contemplation. 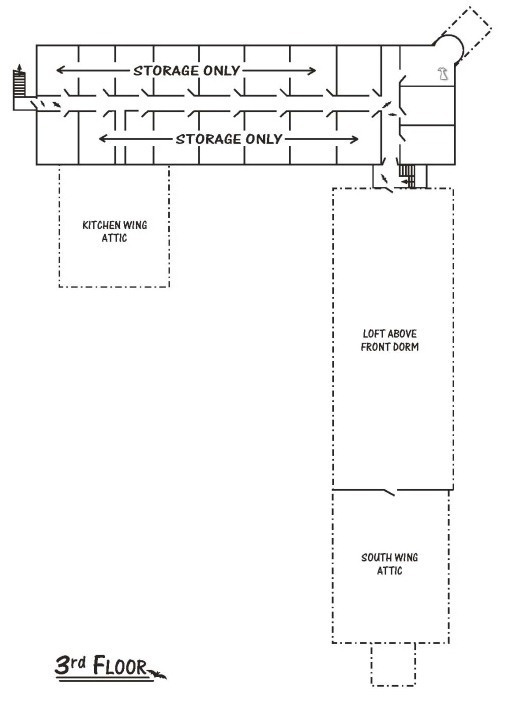 See the ground floor, first floor, second floor, and third floor plans. 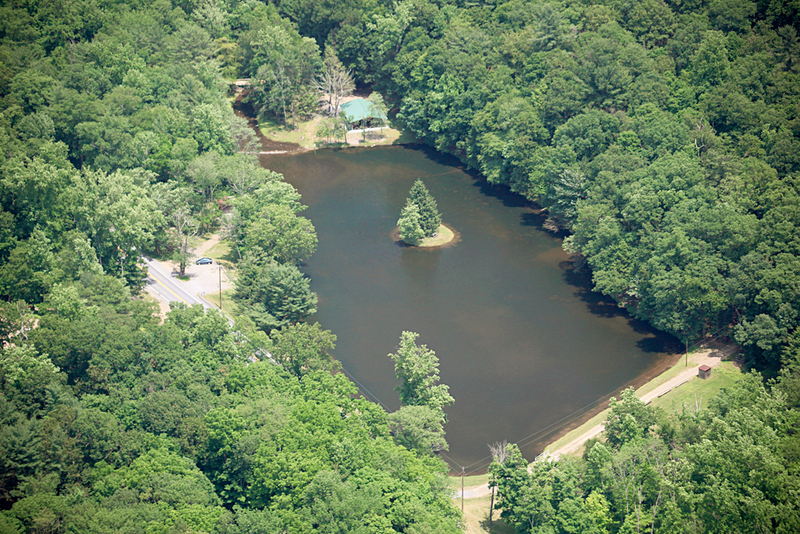 Stevenson Lake has paddle boats, row boats, and canoes in addition to fishing. A lake pavilion shelters picnics and cookouts for small or large groups. 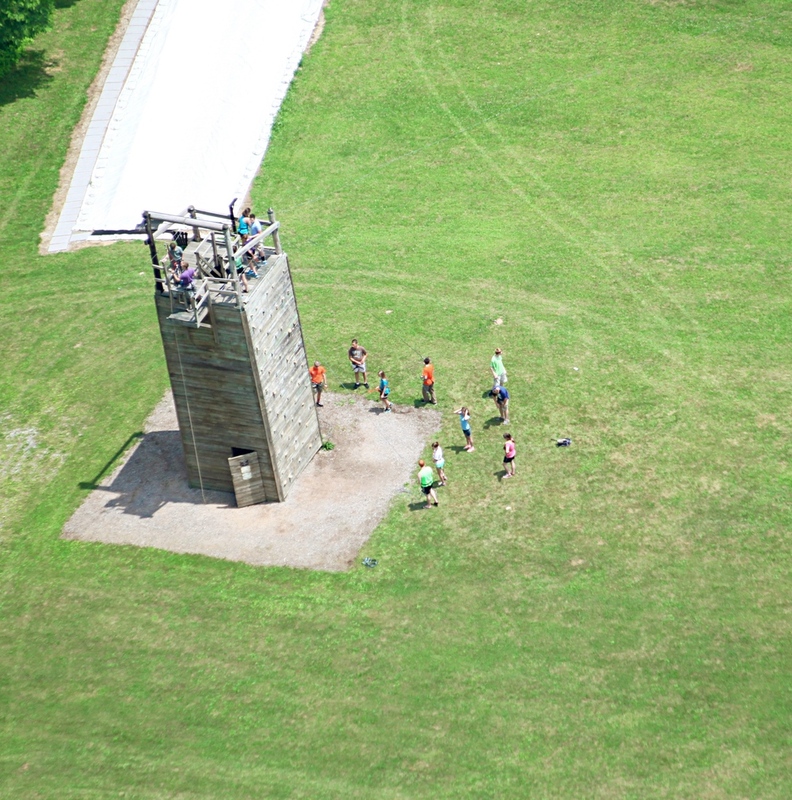 At 30 feet tall, the climbing tower provides multiple faces as different levels of difficulty. The attached zipline travels 150 feet to the edge of the woods. The facility also started out with a simple obstacle course located near the Turing Lodge, the kind of thing found in many Terramagne parks. 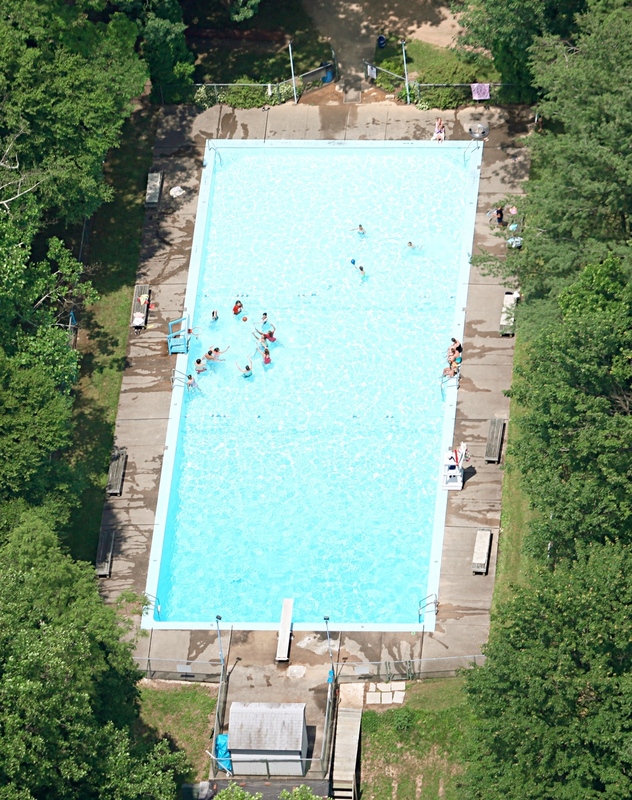 The swimming pool measures 100 feet by 40 feet with a low diving board, patio, and pool shed. Dumont Veterans Retreat began with a relatively simple, portable rope course. The veterans then designed and built a massive rope playground which they named Squirrel Haven. They did the work almost entirely by hand, felling trees and cutting boards, although they did buy the rope and most of the hardware. The work is modular, beginning with the central mast and one connected mast, intended for expansion over time. Playgrounds offer many developmental benefits. Rope playgrounds offer a whole new challenge with frame nets, ladders and rings, and other climbing accessories. You can find instructions on how to make wooden playground equipment, climbing grids, tree nets, and more. 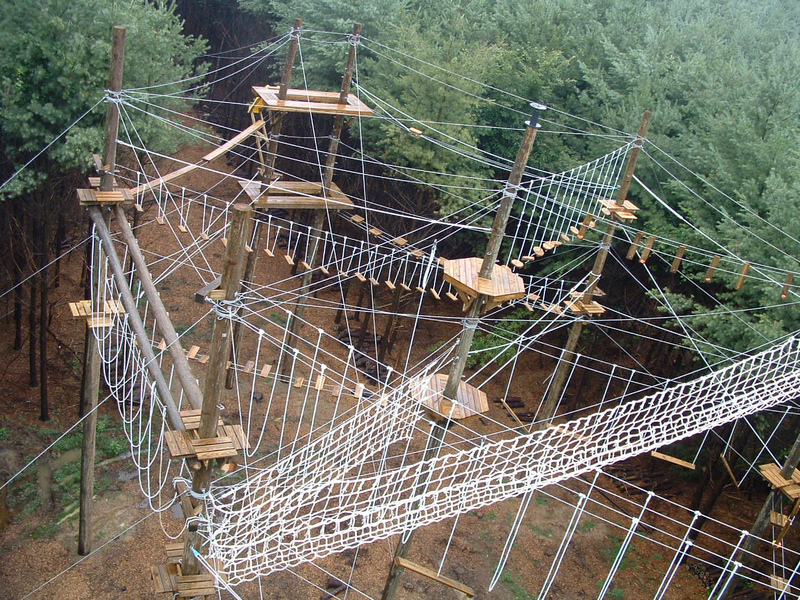 Rope courses use many of the same elements as rope playgrounds, customarily divided into low and high courses. Here are a few tips on how to build a low rope course. Veterans with disabilities face a great many challenges. Accessible sports appeal to many veterans. Resources for veterans help find suitable activities. (Understand that many veterans define "suitable" as "not guaranteed to cause immediate death.") Adaptive principles assist program directors and veterans in modifying activities. Paracord can be made into hundreds of things. This pet harness fastens with plastic clips; this dog harness uses carabiners; for maximum safety above ground, you might make the straps wider and add a hip section. You can make a human harness too. ... So... Holden and Donjae are roomies or suitemates, and Jaimeson is a neighbor. LJ is in one of its "can't play well with others" moods. I fixed the tags but have no idea if they'll stay fixed. Signal boost is always appreciated. Your link to Milo's picture got slightly borked somewhere along the line - it starts with %20http// instead of http:// I found the picture anyway, but thought you'd want to know. Yes, exactly. One of T-America's current trends is providing better support for veterans. So there are a lot of places cropping up that offer semi-permanent living space with other activities and services onsite. Notice that these tend to be run by and for veterans, not just outsiders who want to "help." Fixed, thanks. That is a randomly recurring error.